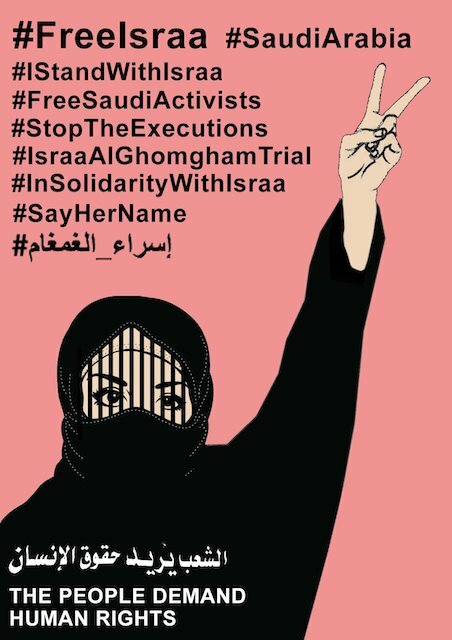 (Global Voices) | – Human rights advocate Israa Al-Ghomgham is facing the death penalty in Saudi Arabia, for her non-violent human rights related activities. Meanwhile, Saudi Arabia’s attorney general Saud al-Mujib arrived in Turkey on Monday, October 29, to join an investigation into the murder of journalist Jamal Khashoggi in the Saudi consulate in Istanbul. Al-Mujib has often been sent after political rivals of the monarchy, and those who challenge the kingdom’s de facto ruler, Crown Prince Mohammed Bin Salman. Leaders around the world have pointed at Bin Salman, accusing him of playing a role in the journalist’s murder. Featured Photo: A #FreeIsraa campaign photo, circulated on Twitter.